Biochar treated Ash trees shows positive effects against Ash die back. Ash die back commonly know as Chalara or as it as now correctly referred to as Hymenoscyphus fraxineus has been confirmed in 24 of the 26 counties in Ireland. This disease causes leaf loss, crown dieback and will eventually lead to the death of most Ash trees either directly or indirectly via infection of other pest or diseases such as Armillaria fungus. The Irish Forest Service are actively monitor the disease in Ireland and in commercial forestry plantations there are grants to remove infected Ash. But for the private gardener the option of removing a beloved Ash tree may be a last resort. Ironically the very trees that are infected can be turned into biochar which can be then used as a preventative measure by air spreading around the roots of the trees. Recent findings by Bartlett tree expert Dr Glynn Percival have shown that trees treated with enriched biochar did not get the disease whilst not treated treed did. Dr Glynn Percival, head plant physiologist at the Bartlett Tree Research Laboratory, said: "While we cannot claim this to be a cure for ash dieback, we are clear that it has a beneficial impact. "We will need to run further trials to be clear on its qualities to prevent the disease taking hold, but this is an important discovery and we believe using enriched biochar could help improve the survival prospects for the UK's ash trees." See more art the link below. It worth noting that here in Ireland I heard it said that around 1916 the poor people of Dublin virtually eat no meat whilst the middle classes consumed around 4lbs per week , even people living on farms back then consumed very little meat - they would rather sell it! Of course some of this video does not totally relate to the Irish situation (our cattle are still primalrily feed on grass and harvest it themselves and we have plenty of water). But as George Lee said the recent increase in milk production will lead to increase in green house gases and it will be the Irish tax payer that will foot the bill . How sickening that will be when so many renewable energy projects that could have happened but for lack of real Government support, as opposed to lip service that is so common amongst our leaders. Another example of making biochar at home. 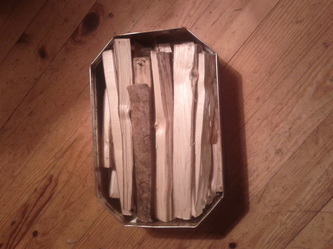 Simply get an old paint tin (best to pre burn it to remove contaminants). 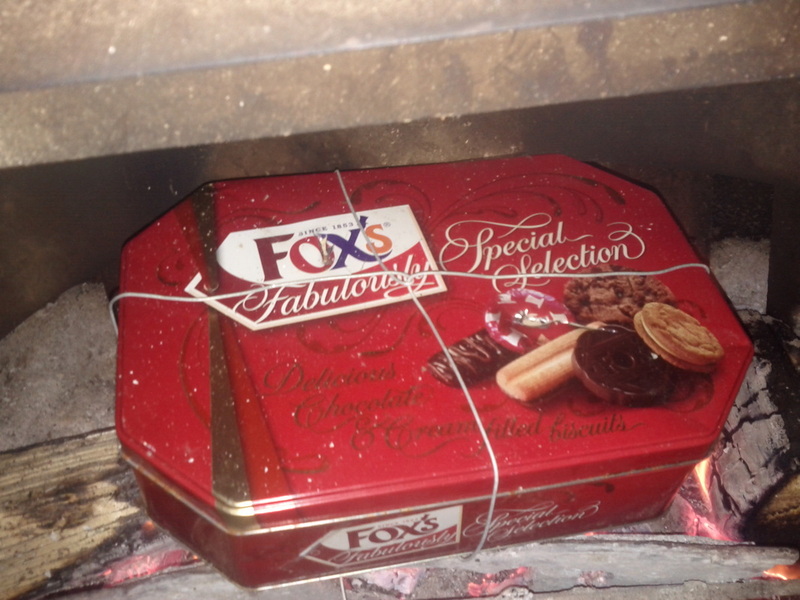 Then make sure you punch hole in the lid to allow gases to escape (as in the picture below) then insert a strong wire to as as a handle and place over any fire, this will take a a couple of hours depending on the heat of the fire, the particle size and moisture content of the biomass. The evolution of the ability to break down a plant's protective lignin largely stopped the geologic burial of carbon that formed present-day coal deposits—and may provide secrets to making biofuels from inedible parts of plants. Cork students win Google prize for use of diazotroph bacteria as a cereal crop germination and growth aid. One of the attributes of biochar is its ability to increase/improve germination - could what these Cork girls have discovered be the reason for the positive effect biochar has on germination, after all its well know that biochars microscopic pores harbour many bacteria and fungi. 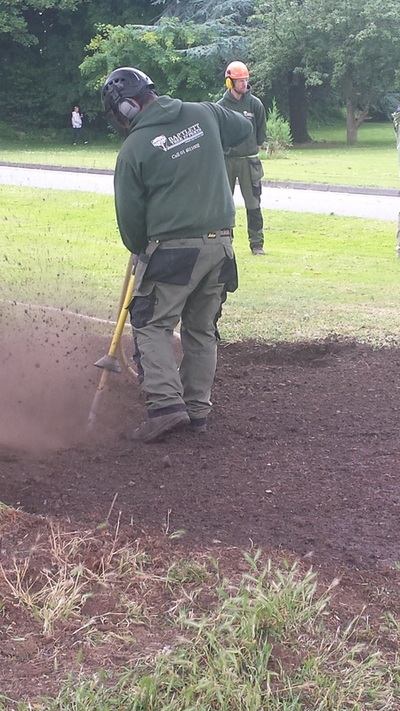 Bartlet tree services had a demo day last summer in Dublin and the use of biochar to improve tree growth was mentioned. Its believed the number of plant-enchaining microorganisms, such as Trichoderma are boosted in soils amended with biochar. These microorganisms play a role in eliciting a response know as systemic induced resistance(SIR). SIR can result in the increase in defense mechanisms within the plant that reduces damages from insect and disease pest. Over the last 200 years our soils have lost over half their soil carbon, see what these cattle farmer are doing to put it back into the soil. 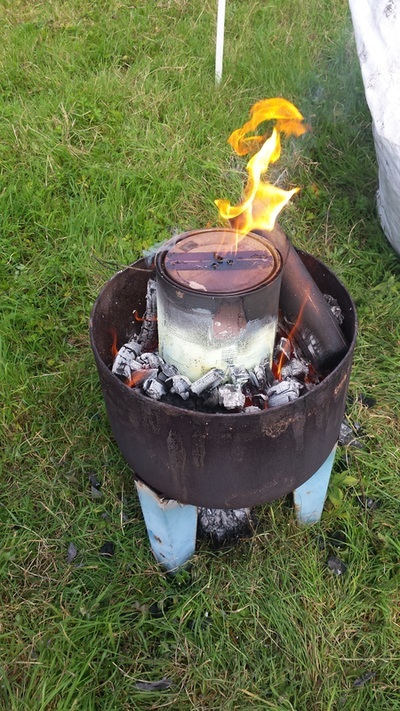 Make biochar and at the same time cook and produce electricity. 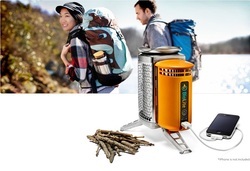 Now it is possible to cook food, make biochar and produce enough electricity to charge your mobile phone whilst out camping. It could also be very hand to have in the house in case of a power cuts. The Prize is $25 million and there are 11 finalist of which 3 are Biochar related. Researchers report that wood-biochar supercapacitors can produce as much power as today's activated-carbon supercapacitors at a fraction of the cost – and with environmentally friendly byproducts. 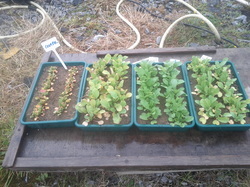 First tray with Radish on the LHS is the control and the others have biochar added. 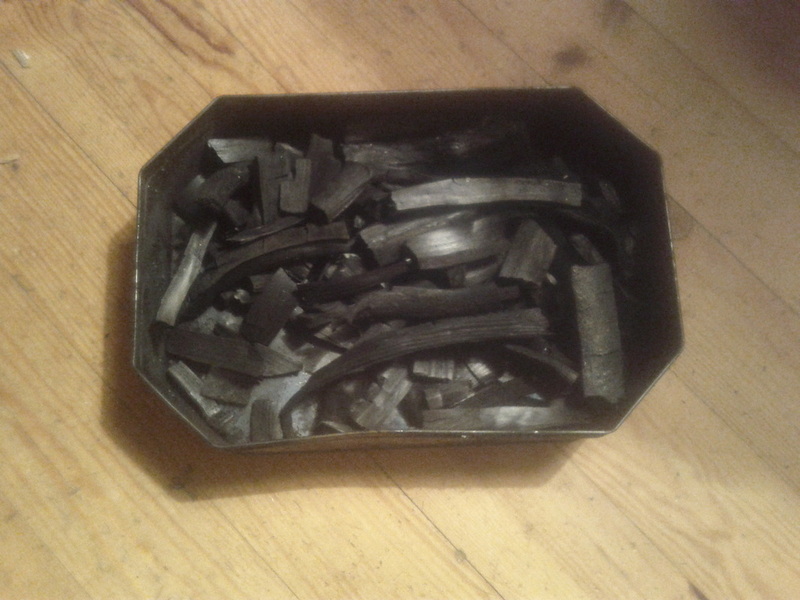 Bithghualach - the irish for biochar. I posted a query on the Foras na Gaeilge web site wondering what the irish for biochar would be and i am told it is Bithghualach which roughly translate to 'bio charcoal'. Now you can enjoy a bit of charcoal with your tea or coffee. 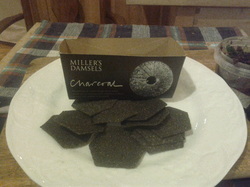 Now you can have nice cup of tea and some charcoal and they taste nice! Lawrence D. Hills book 'Month by Month Organic Gardening,The Green Gardeners Calender' first published in 1971 is considered a bible for organic gardeners and growers. It well worth having on ones book shelf as a reference book. The pdf file below is from pages 34 and 35 of 1989 edition and he talks about using wood ash in the chicken house and he goes as far as saying ''It is worth keeping chickens, if you have a wood stove,to get fertilizer". Remember part of the wood ash will be made of carbonized wood ie charcoal. We all hear how the biochar should be 'precharged' before use, so what better way than to spread biochar in the chicken house. By spreading it under their roost you will get the chicken droppings mixing with the biochar = precharged. It also helps reduce the ammonia odour associate with chicken houses and it hygienic and the chickens appear to like scratching it. 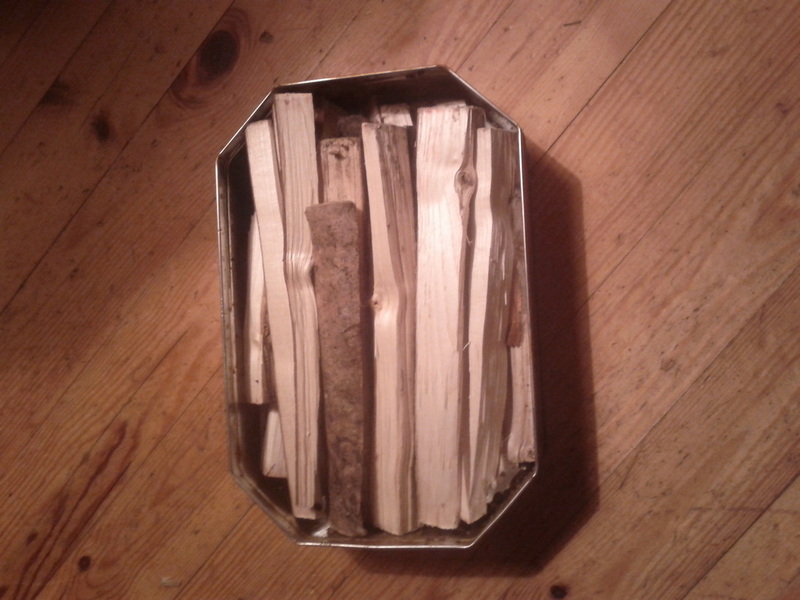 I will clean this batch (it’s was the waste left over after packing) out this spring and use in my garden. I expect good results as chicken manure has the highest NPK of any domestic animal. Its particularly high in Nitrogen , because chickens don’t excrete urine separately.